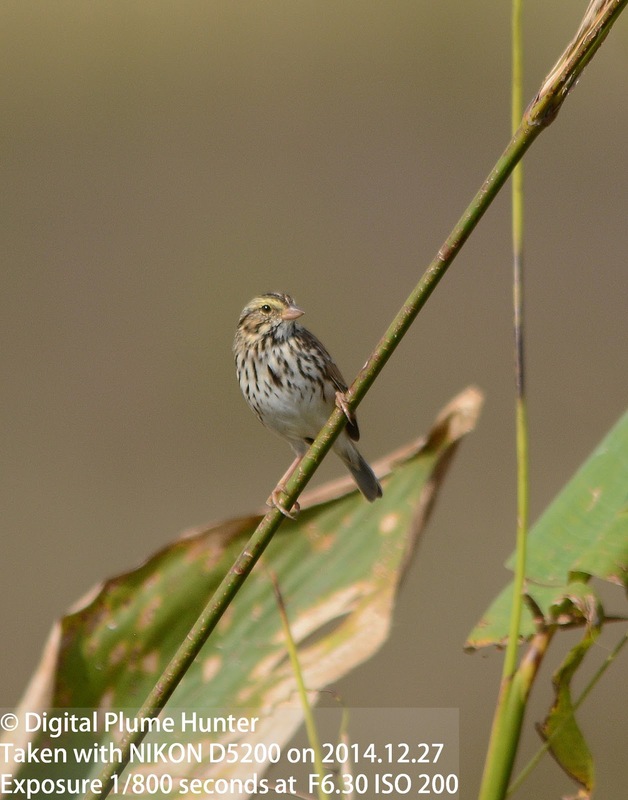 Nelson's Sparrow has proven to be stubbornly averse to photographic observation with this blogger's prior attempts having been resoundingly defeated and rendered utterly fruitless on more than one occasion. 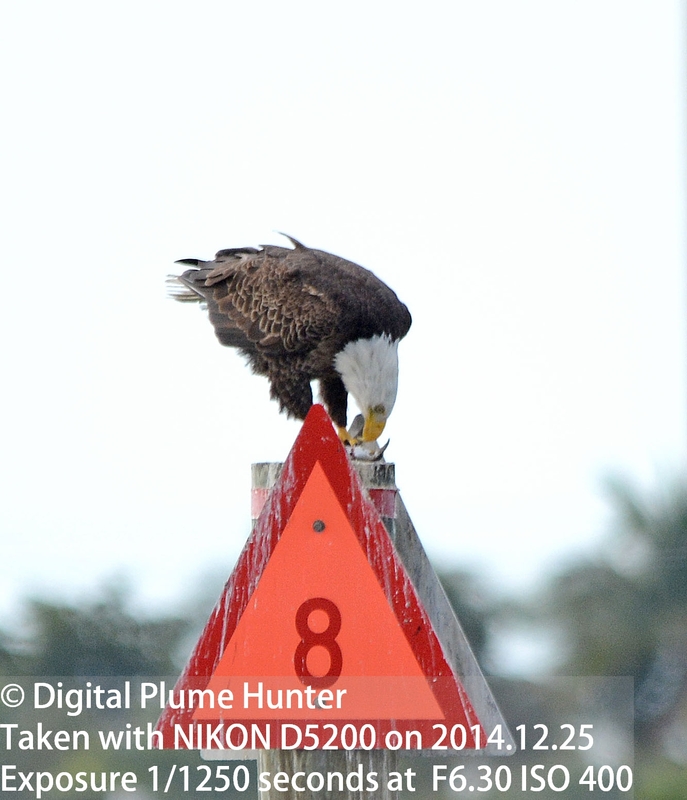 Would a winter trip to SW Florida finally break the jinx? Optimistic that the time was ripe for lifting the curse of the "no show" Nelson's, this blogger jumped at the opportunity to meet up with Bob Pelkey behind the Publix at John Morris and Summerlin at Bunche Beach Preserve. 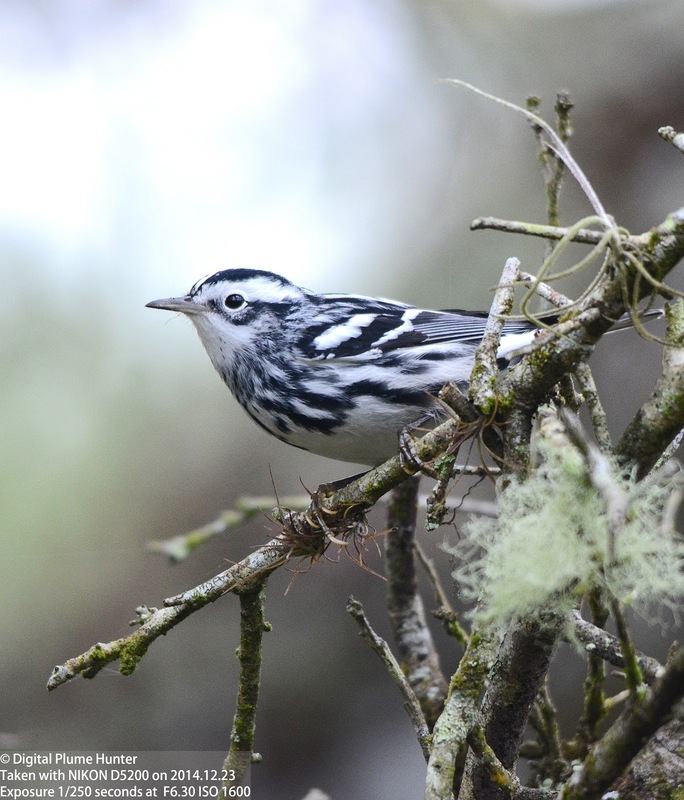 After diligently slogging through the tall grass in marshy habitat, and frustratingly beguiled into mis-identification by the odd Palm Warbler, our quarry was finally sighted. 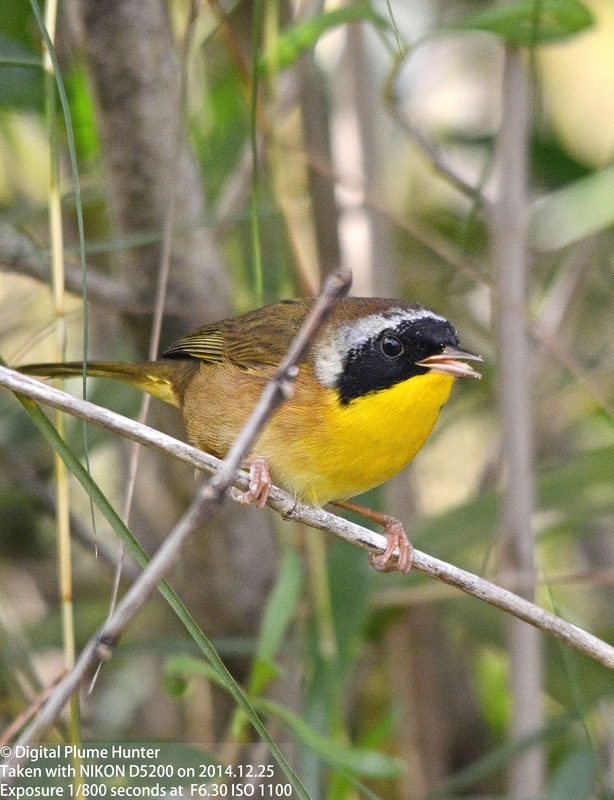 However, it would take a repeat attempt before the Nelson's Sparrow would acquiesce to photography. 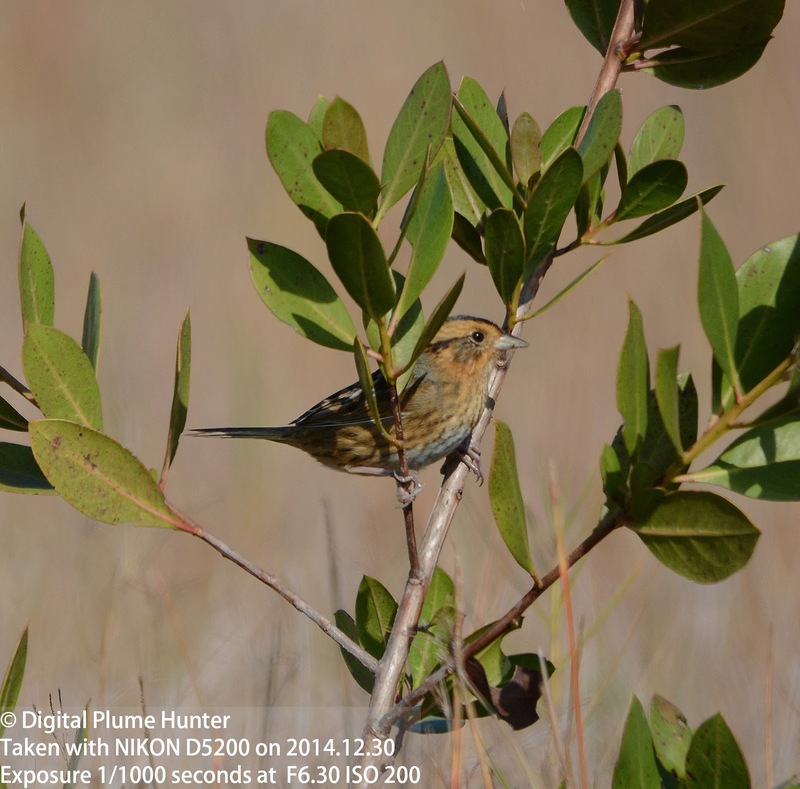 Both Nelson's and Saltmarsh Sparrow can be found at this venue (indeed, both were seen) and their similarity can spark confusion. The difference boils down to the degree of buffiness and the boldness of the streaking on the flanks -- Nelson's is buffier overall while Saltmarh's streaking is crisper and bolder. Elation over the successful sighting and (digital) capture of the Nelson's outweighed any concern over soggy footwear due to water-logging in this marshy area. 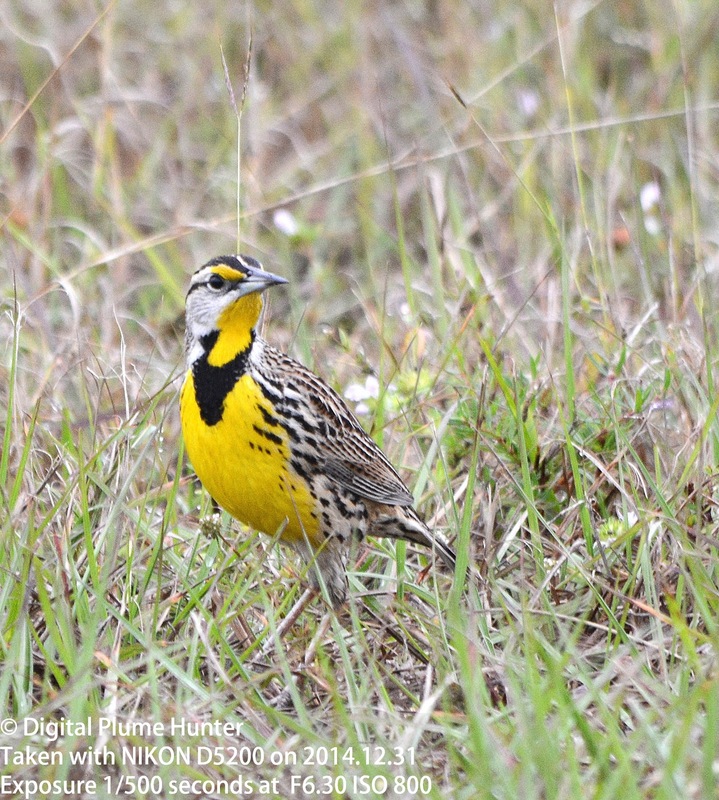 A small price to pay for a Lifer! 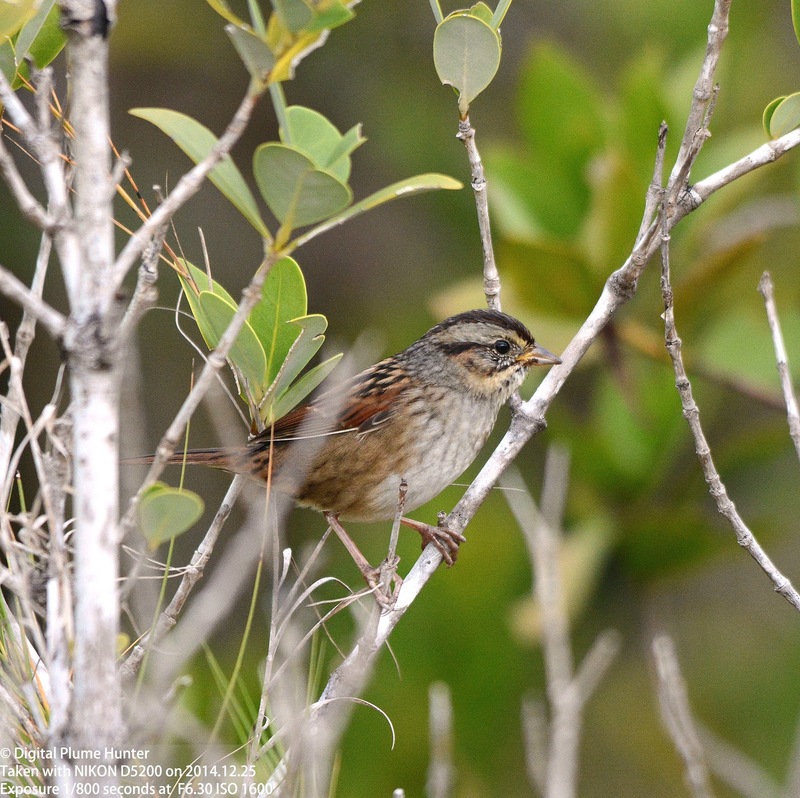 With a grey face, black eyeline, reddish back and an unmarked grey breast, the Swamp Sparrow ranges across the Eastern half of the US. 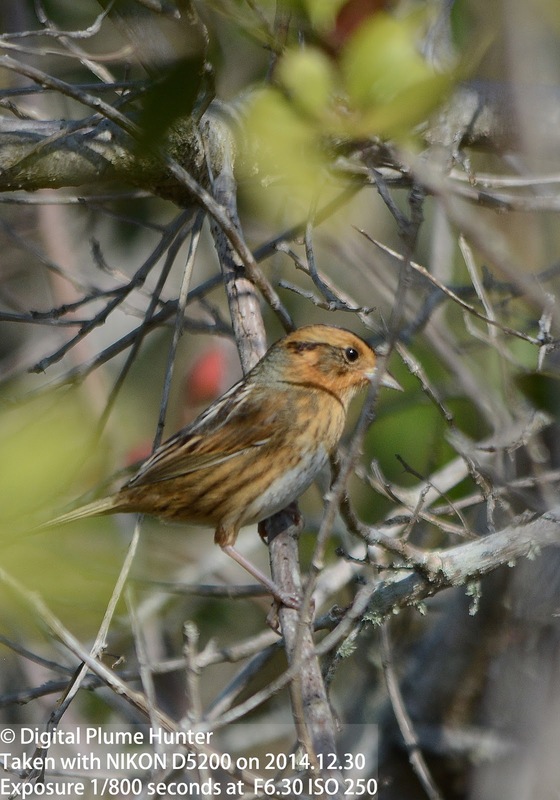 Contrast this with the Nelson's Sparrow which is much more restricted in its distribution -- found breeding only in the interior US and coastal North Atlantic. 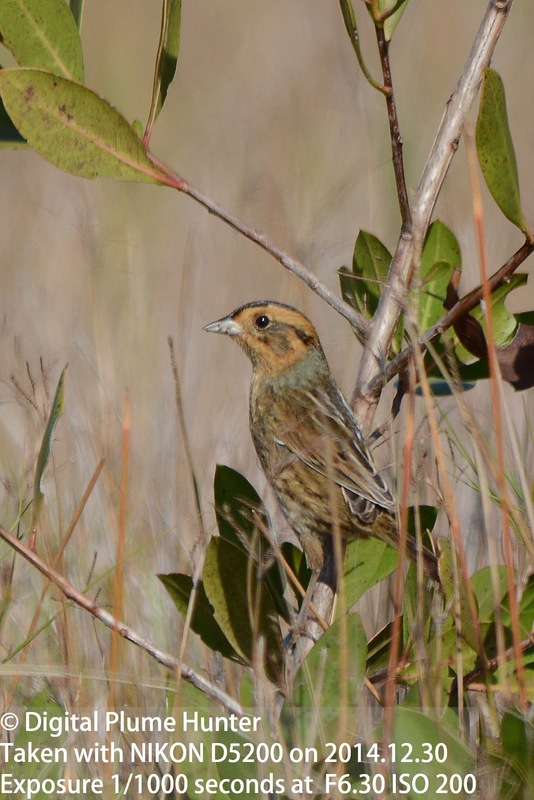 Harns Marsh has been reliable for sparrow observation on prior occasions (eg., a Grasshopper Sparrow in Feb 2013) and Savannah Sparrows on this visit were found fairly commonly -- alternately flushing from, and dropping into, the thick grasses. 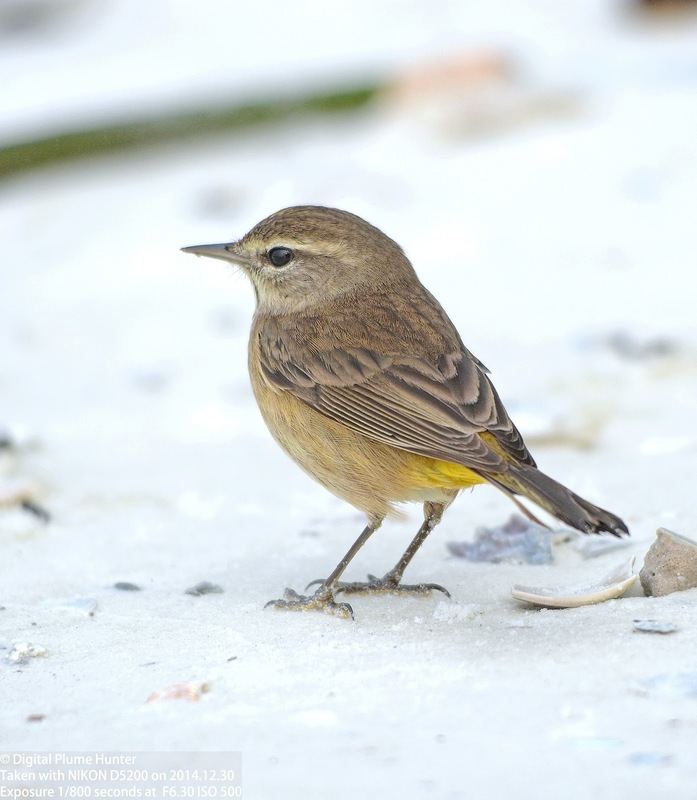 Compared to its breeding plumage (eg., a specimen from Michigan in May), there is less yellow on the supercilium but otherwise both alternate and basic plumages are similar. 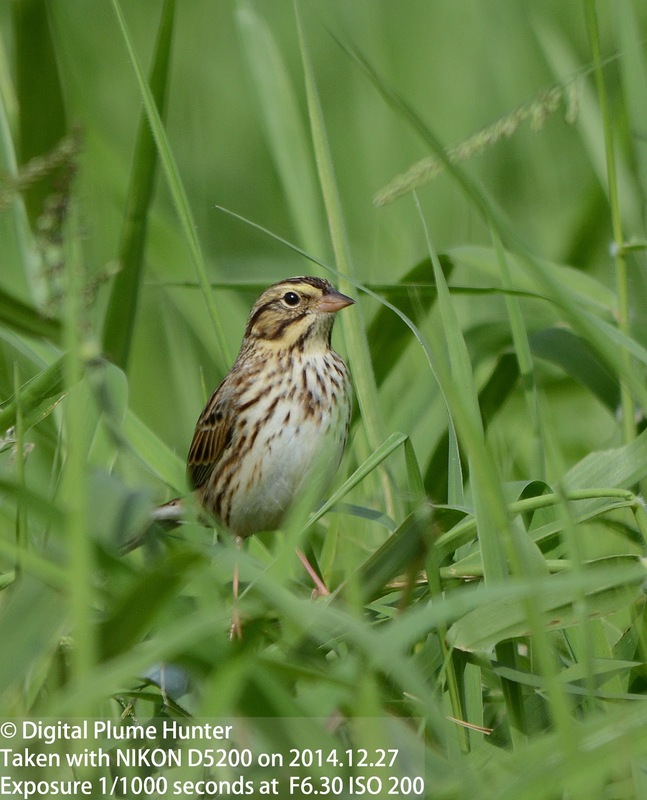 Savannah Sparrows are found coast to coast in the US and it is uniquely the Western subspecies, the Belding's Savannah Sparrow, that tends to be darker and larger billed. Endemic to Florida and classified as "Vulnerable", it is a delight to see these beautiful corvids amidst the ugly suburban sprawl of Cape Coral. 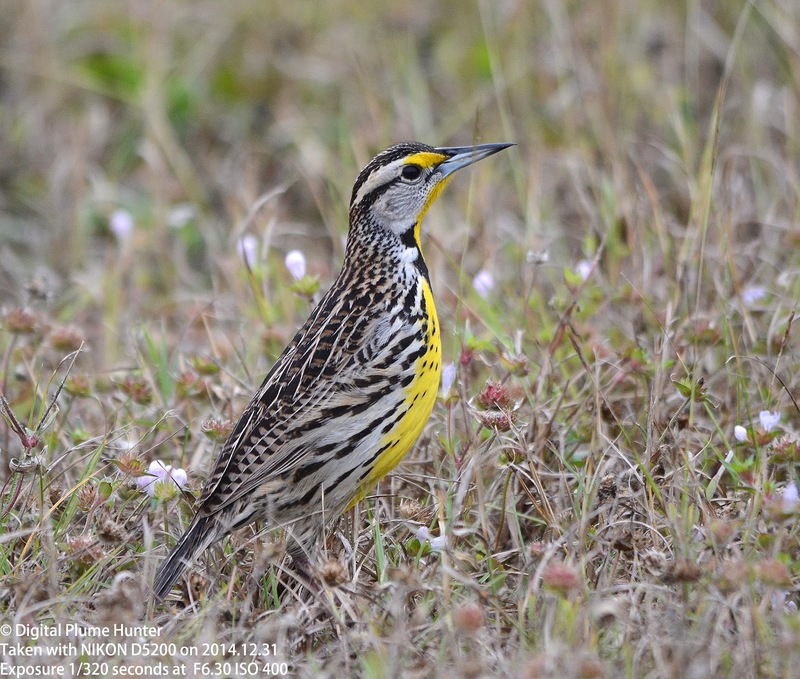 While many of our blackbirds are atrocious songsters (Grackles, Red-winged and Yellow-headed Blackbirds, etc), it is only the Orioles and Meadowlarks that can truly musically impress. 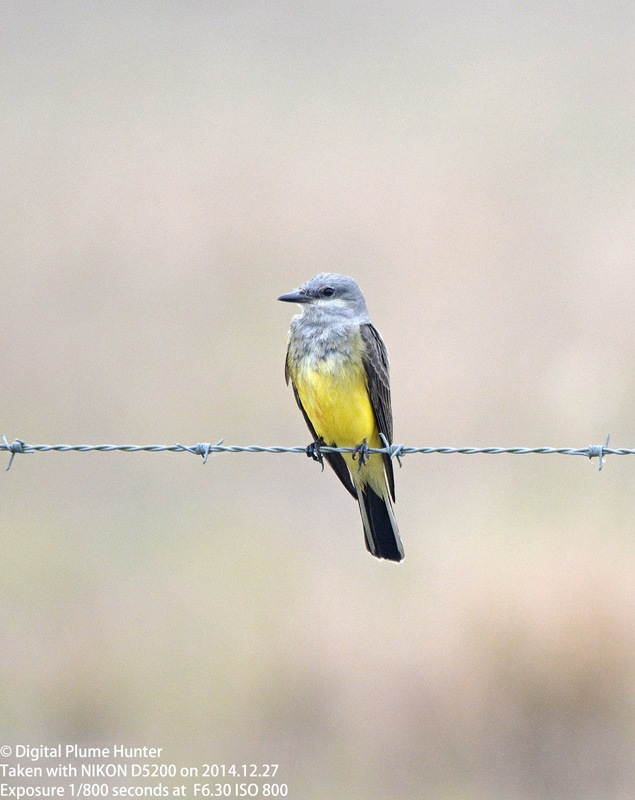 Southern Florida is fortunate to attract a unique mix of overwintering flycatchers -- besides the drab Eastern Phoebe, there are the more flamboyant Scissor-tailed Flycatcher, Vermilion Flycatcher, and Western Kingbird as well. 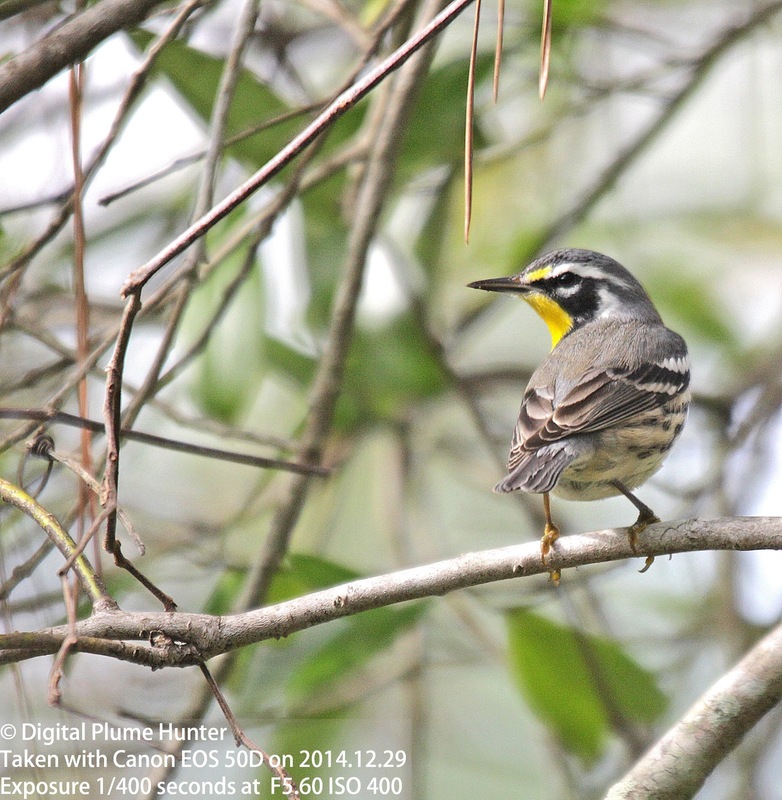 It is always a delight to observe these bold and noisy tyrant flycatchers. 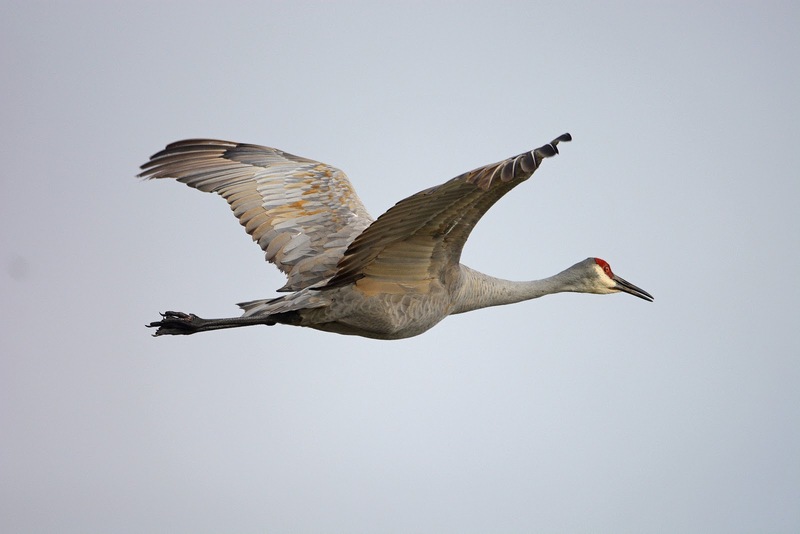 A Sandhill Crane flyby seen at Harns Marsh. 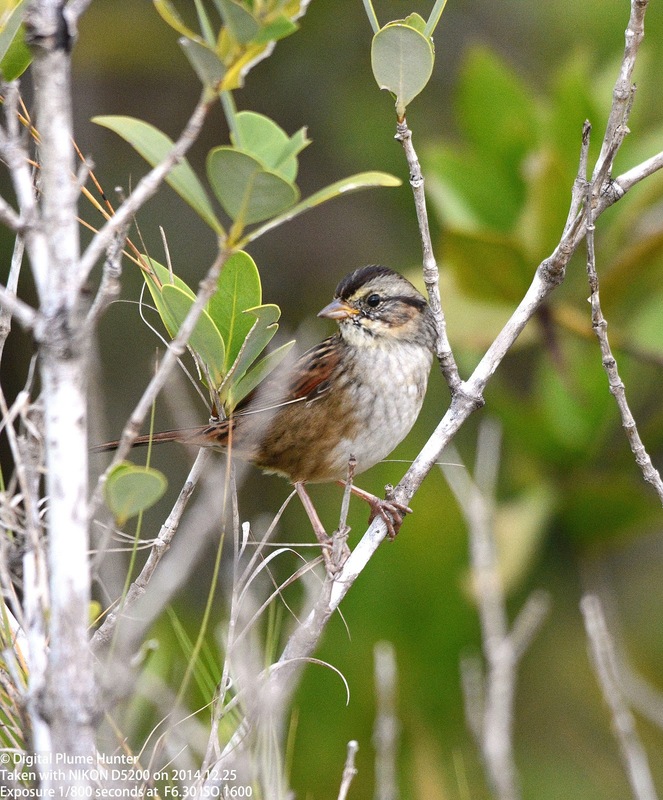 Sparrows are the "little brown jobs" that can both confound and delight in equal measure and a Lifer in the form of Nelson's Sparrow assured that this excursion to SW Florida was a success on many levels -- not least for finally breaking the Nelson's jinx! The above is not exhaustive and there are probably more resources than I am presently aware (please post a comment below on additional resources). 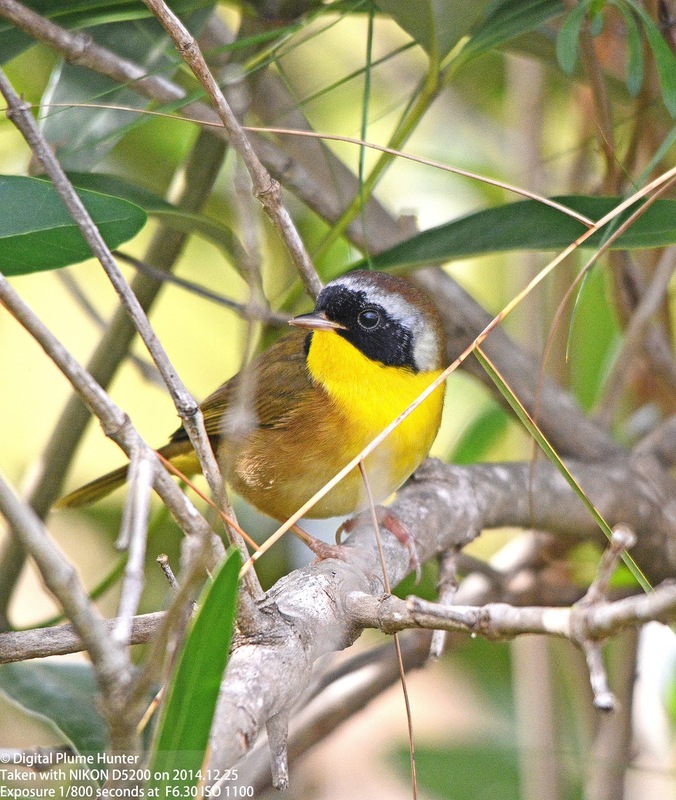 After ongoing conversations about the state of Miami’s birding community, several like-minded individuals decided to put words into action. We are here to stir the pot. 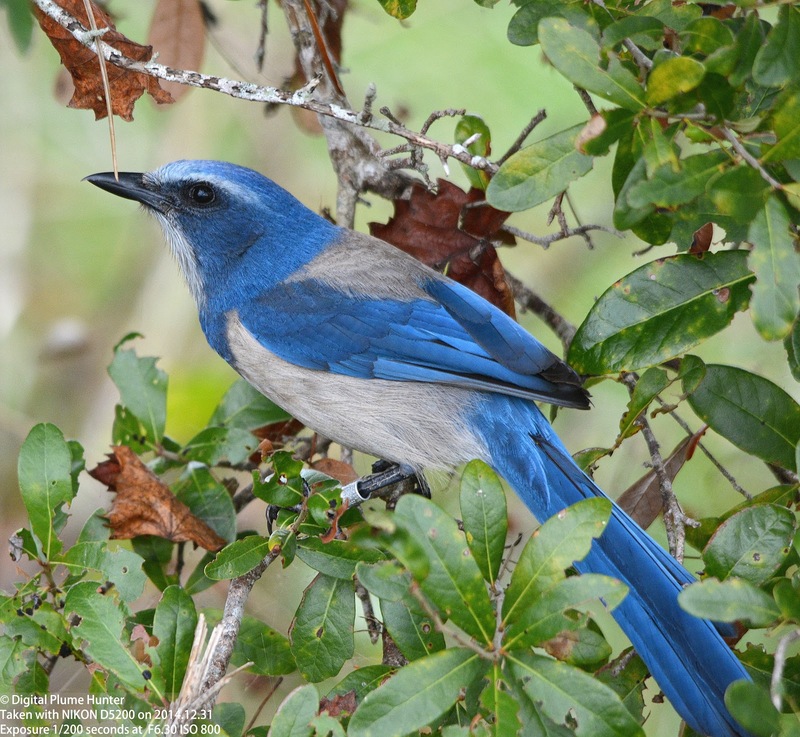 The Miami Birding Wave aspires to encourage the development of our community, serve as an olive branch to new and established birders, and shape the image of the birding culture in the Magic City. 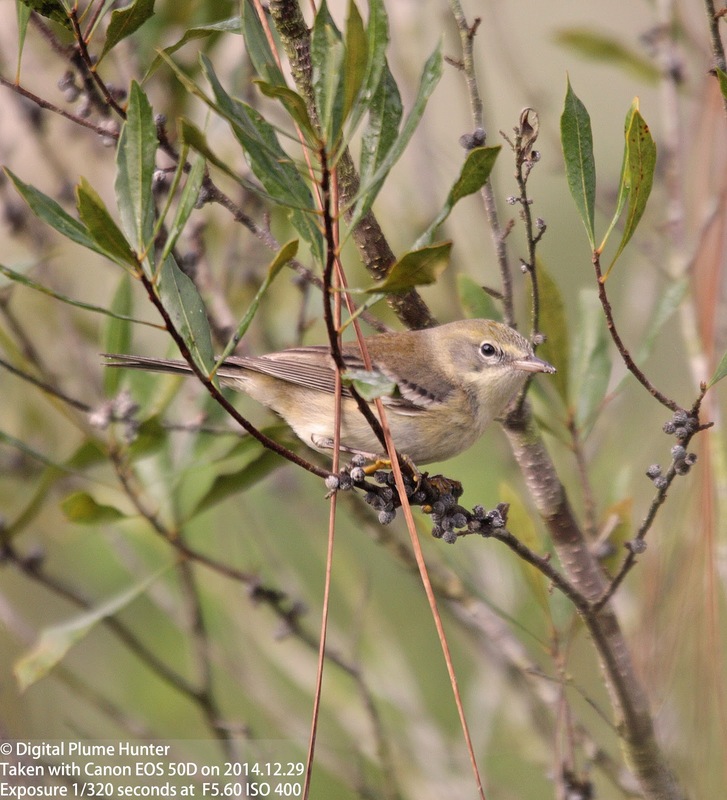 Indeed, it appears what's already happening in SW Florida now appears to be organically taking root on the other side of Alligator Alley and the result is the Miami Birding Wave (contact Alex Harper). 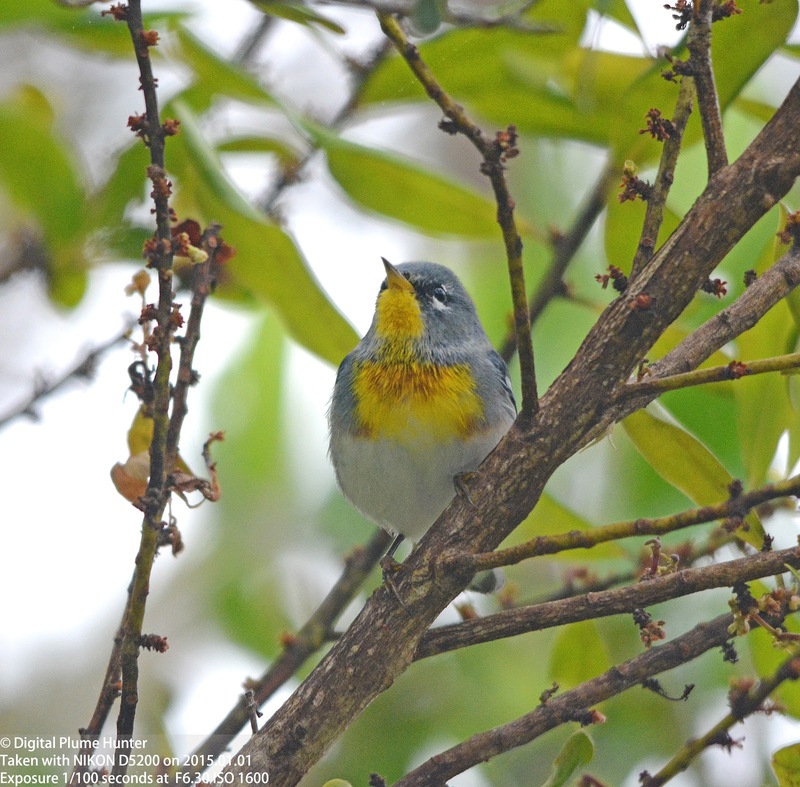 A quick browse through this website and it becomes evident that the protagonists of this birding revitalization movement have rapidly accomplished some really cool stuff: chasing rarities (Key West Quail Dove), conducting birding blitzes (128 species in the Miami metro area in a day) and more. 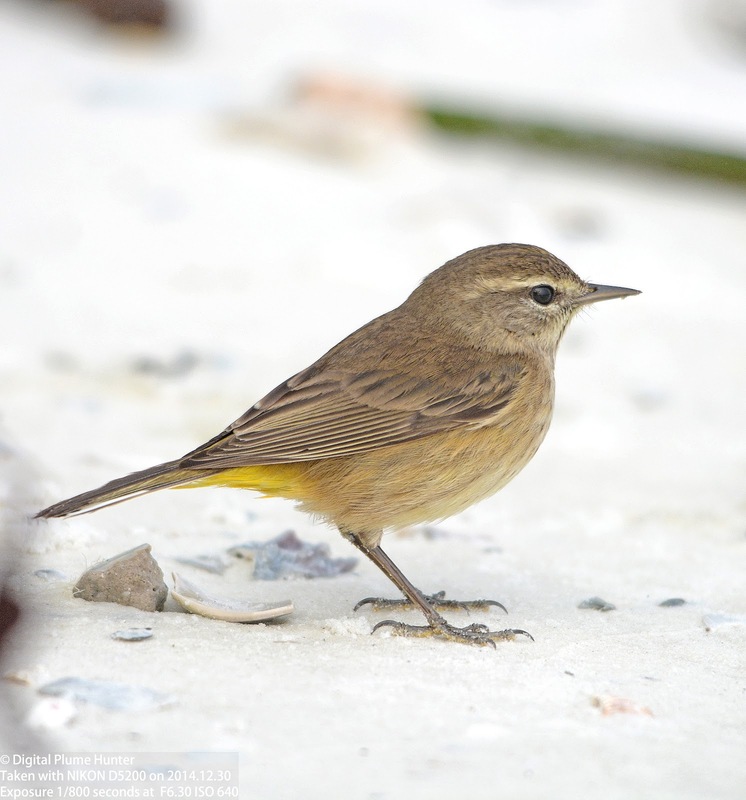 With 2 more possible: American Redstart and Northern Waterthrush. 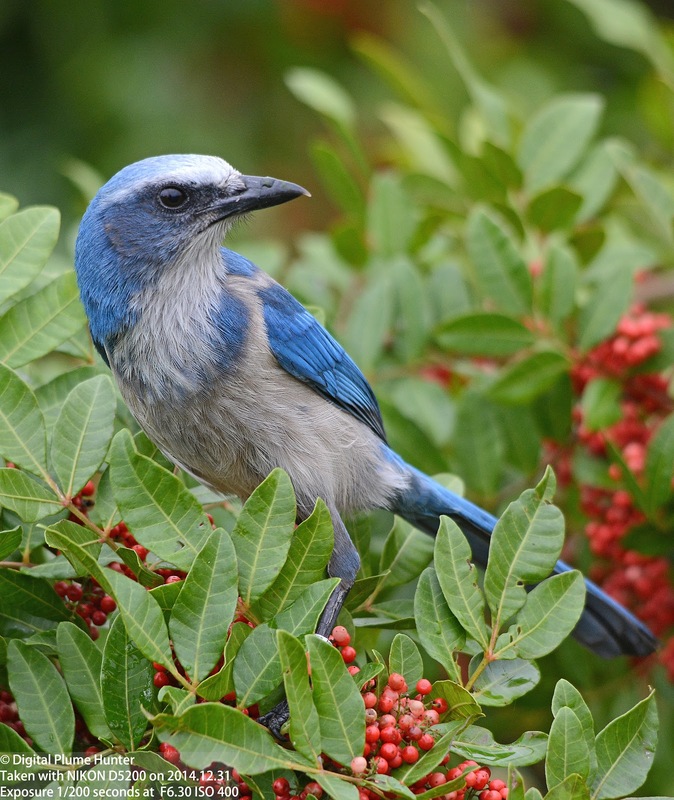 However, this number is still only half of what the Miami Birding Wave are finding -- 25 species this winter including Swainson's, Worm-eating, Orange-crowned and Magnolia --Well done Miami Birding Wave! 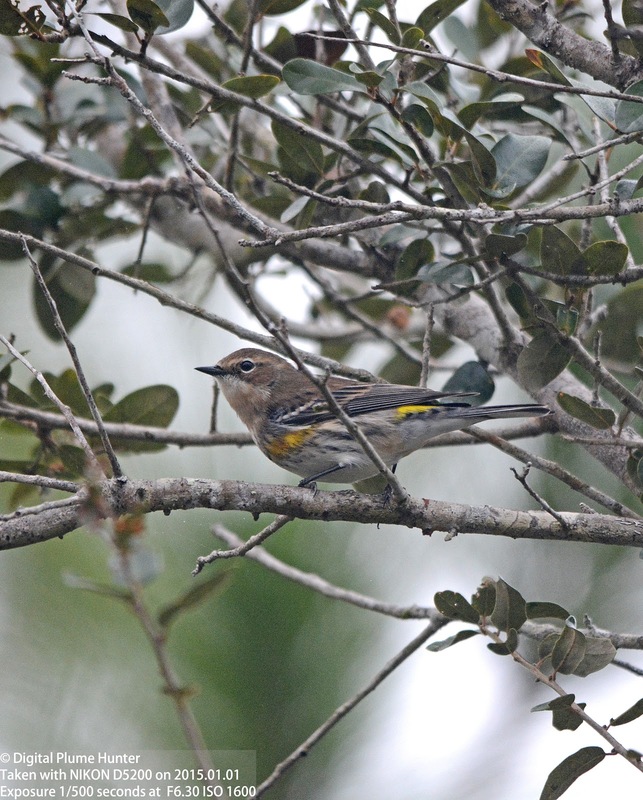 In this blogger's recent trip to SW Florida, only the following 8 warbler species were observed -- a number, now seemingly grossly inadequate, that will surely have to be improved upon in the future! 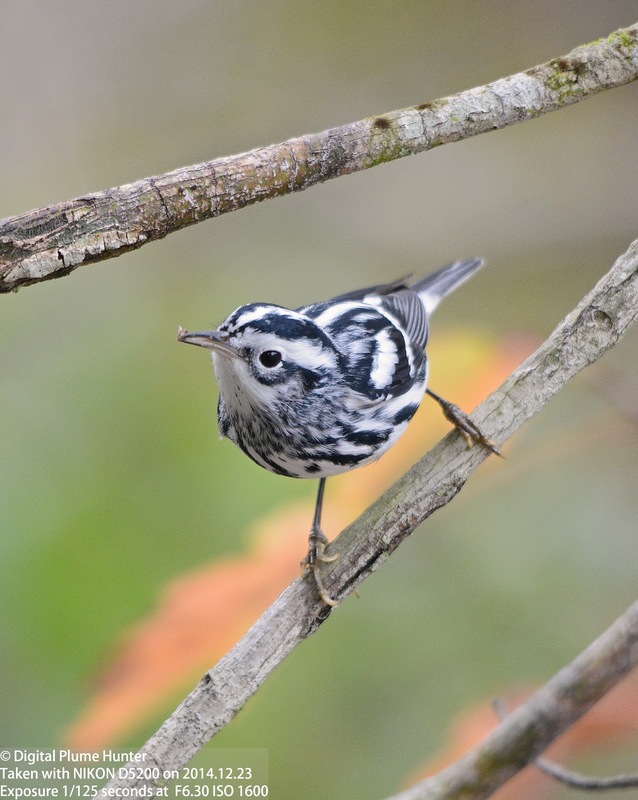 The Black-and-white is one of our most photogenic warblers. Comparatively easy to spot owing to its tendency to hug tree trunks and branches, its "speed foraging" makes photography challenging. 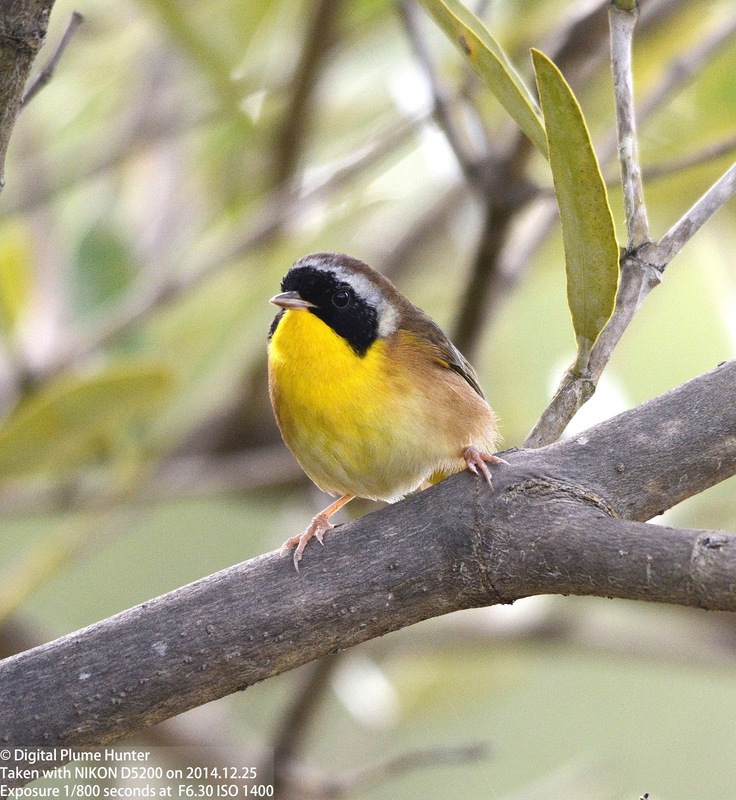 Unlike the generously visible Black-and-white Warbler, the Common Yellowthroat remains hidden in weedy areas and views are brief. 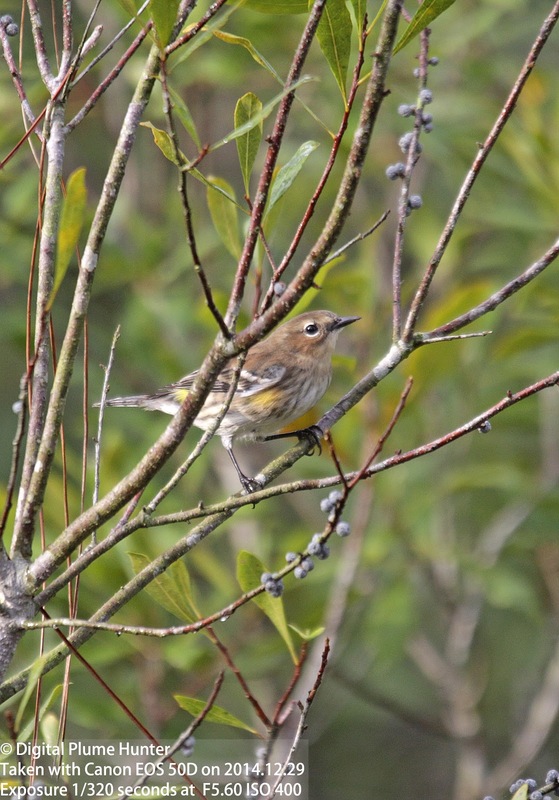 Demoted to subspecies status since 1973, Myrtle Warbler is now lumped with 3 other sub-species (Audubon's Warbler (Western US), Black-fronted Warbler (NW Mexico) and Goldman's Warbler (Guatemala) -- read this excellent article on the associated genetics) as the Yellow-rumped Warbler. 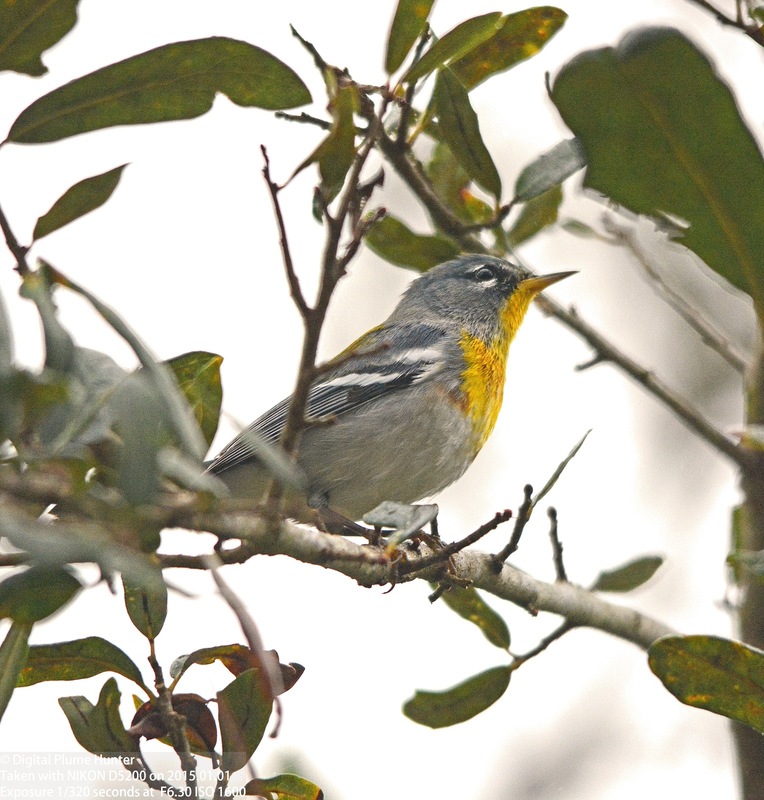 Northern Parula is a year-round resident at Corkscrew and this male is already coming into its alternate plumage. 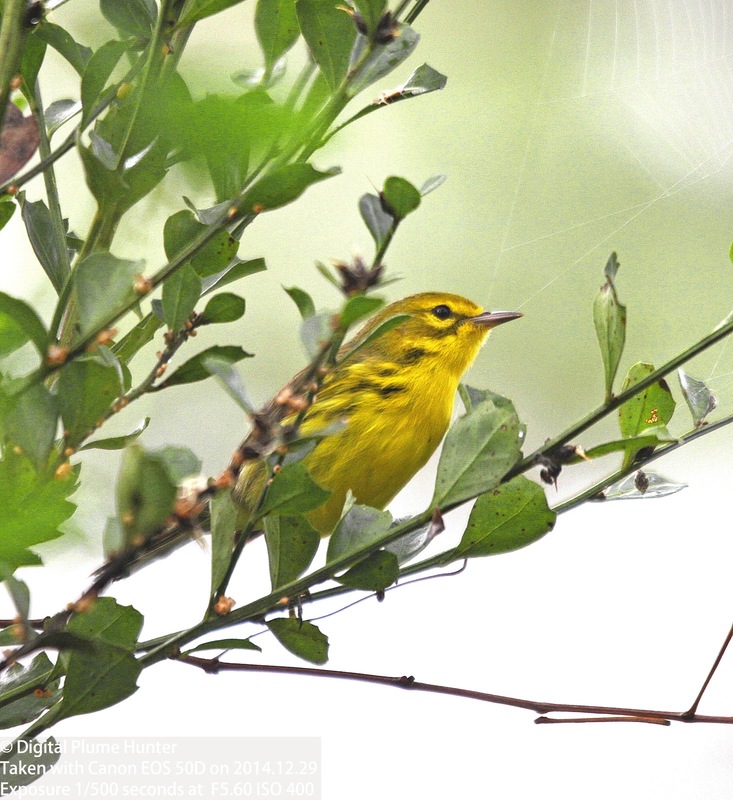 Prairie Warbler, like the Parula, is a resident species although numbers are likely augmented by wintering migrants. 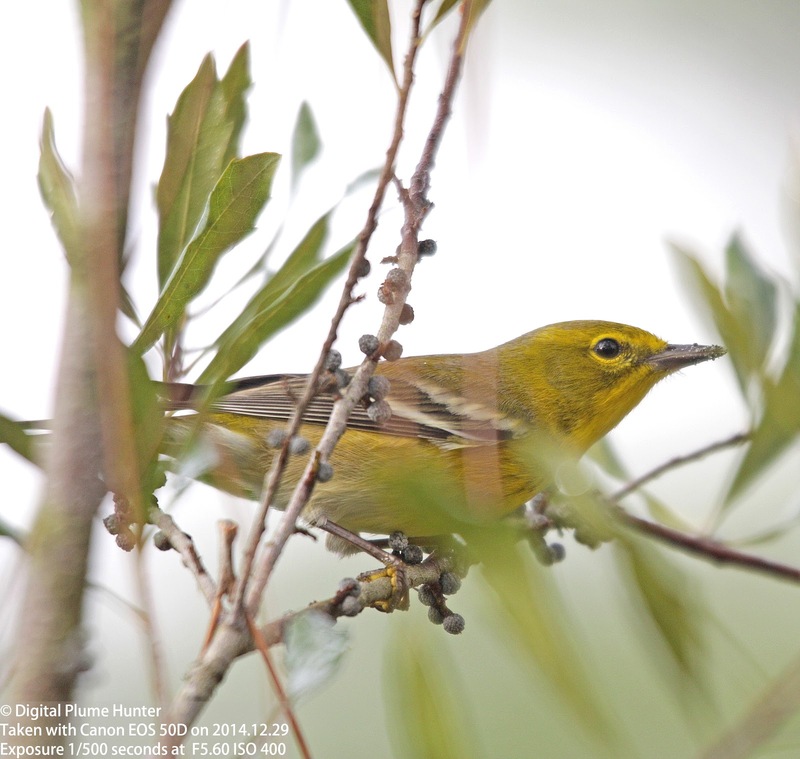 Pine Warblers are not infrequently encountered with Brown-headed Nuthatches and Yellow-throated Warblers at Corkscrew. 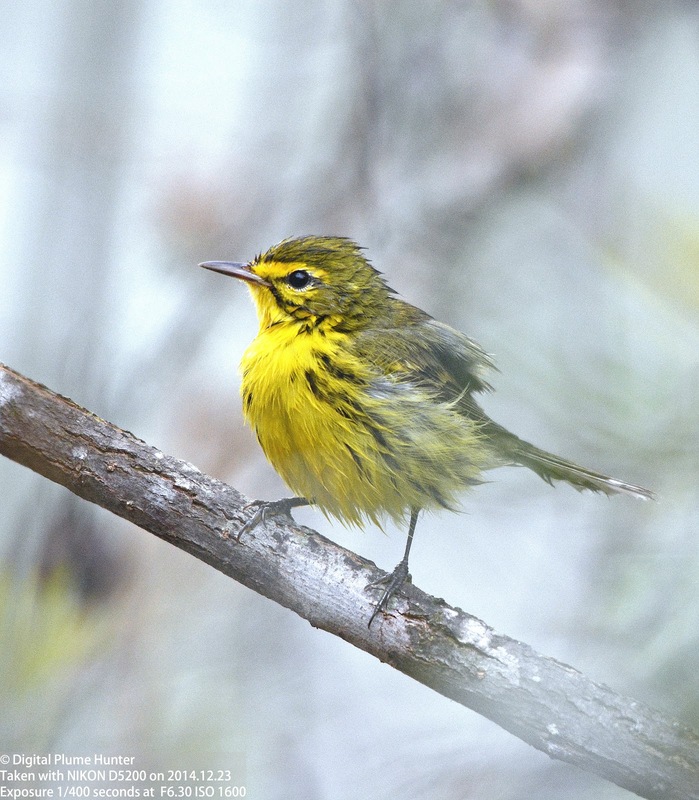 Palm Warblers are on the drabbest warblers in their winter plumage and can be found foraging virtually anywhere in SW Florida -- in urban parking lots, sandy beaches, and wooded areas. 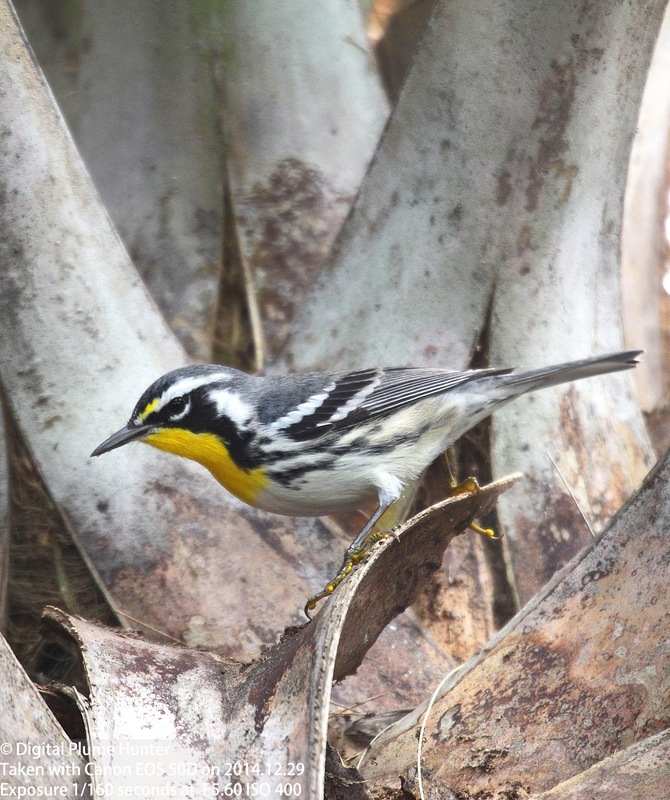 The Yellow-throated Warbler appears to be taking advantage of global warming by extending their summer range into the Northern reaches of the US. 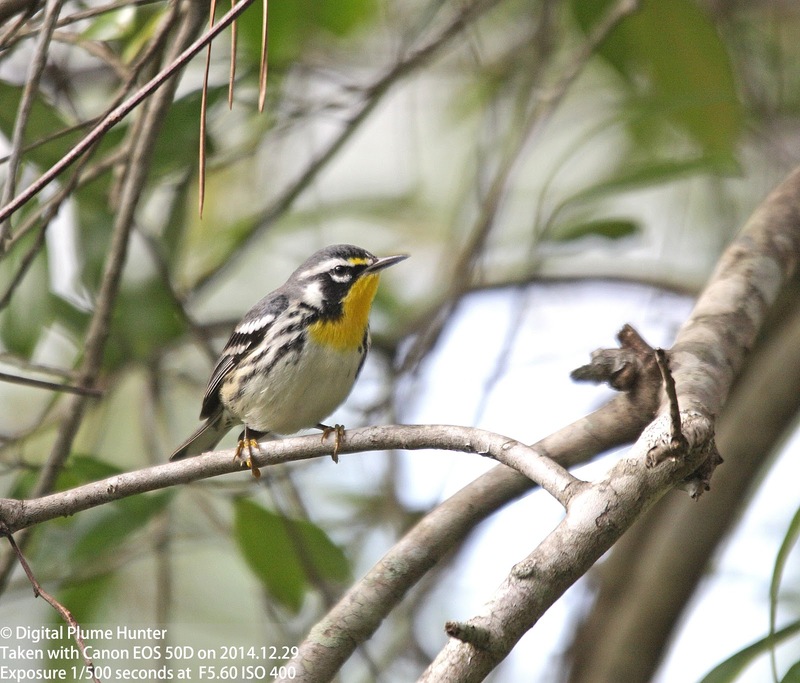 They were observed by this blogger for the first time at Magee Marsh last Spring. 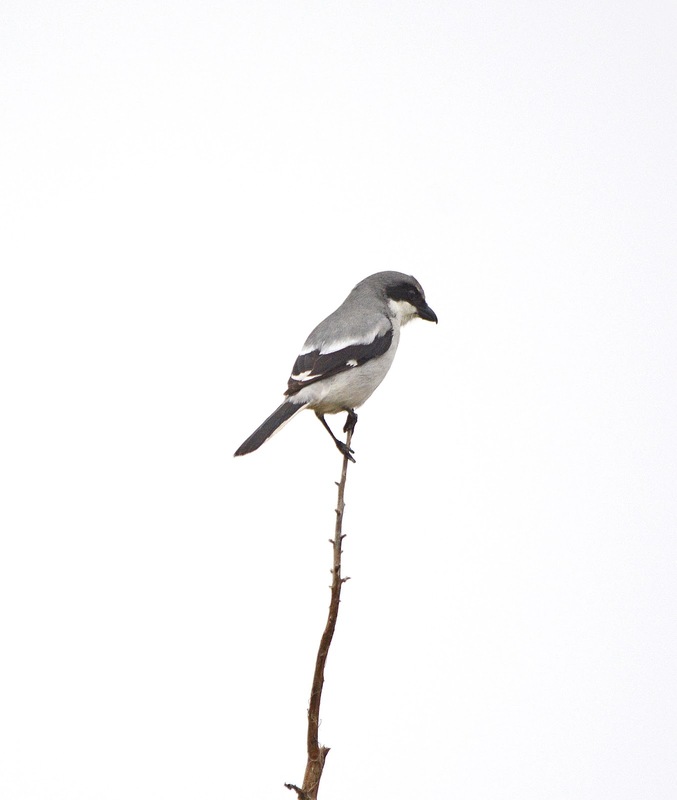 Shrikes, though no less in ferocity as hunters, are not included in the birds of prey classified as raptors. 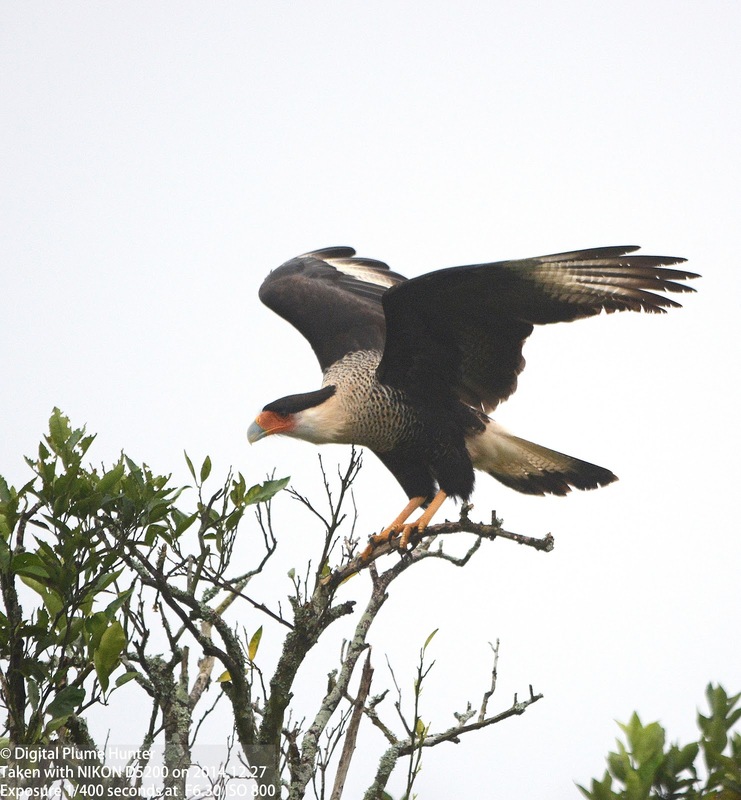 Caracaras are large, imposing falcons of the New World; and, as of just a hundred years ago, there were 3 Caracara species on this planet: Northern, Southern, and Guadalupe. 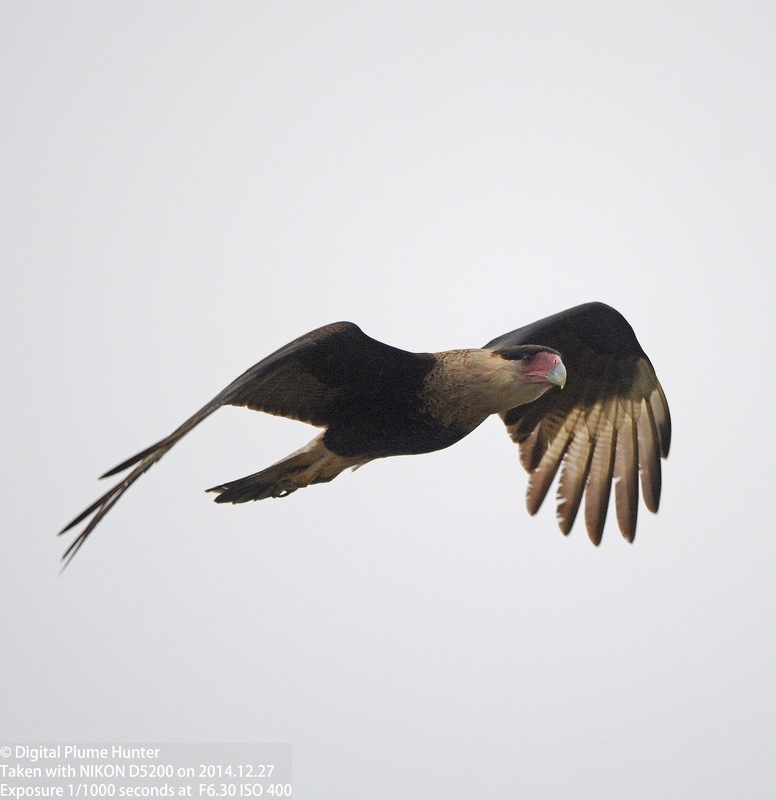 The Guadalupe species was shot and poisoned to extinction by farmers who believed their goat herds were at risk of predation and the Guadalupe Caracara went from being Common to Extinct in a remarkably short span of time. The final coup de grace, however, was unwittingly delivered by the American ornithologist Rollo Beck (of Beck's Petrel fame) who "collected" most of the last remaining survivors in 1900 (a pattern he regrettably and infamously repeated by "collecting" 3 of the last 4 Pinta Island tortoises with identical results). 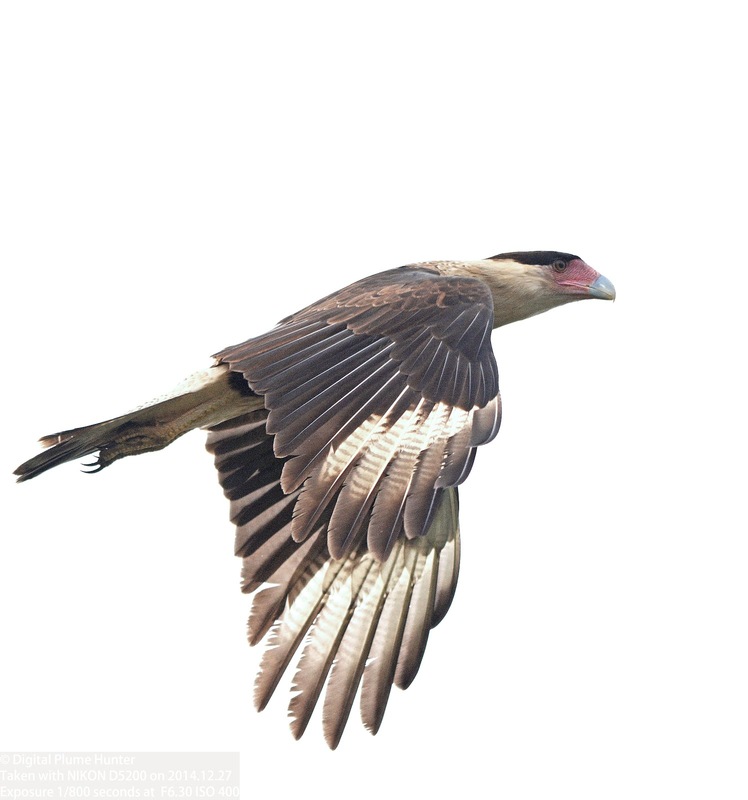 Although belonging to the Falconidae, the Caracara is neither a formidable hunter nor a a swift, aerial missile like other "true" (Falco) falcons such as the Peregrine. 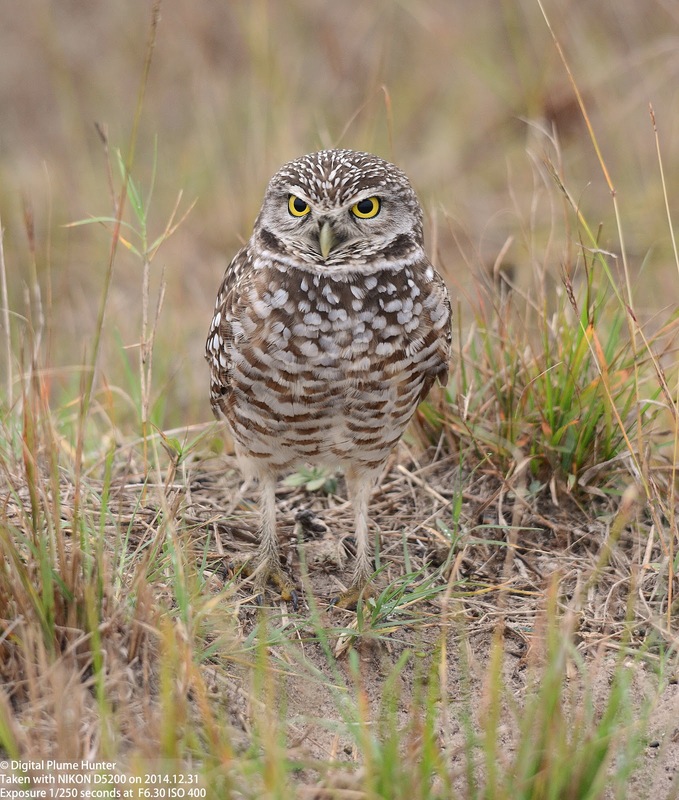 It is, however, a large scavenging raptor, weighing up to 3 lbs with wings that span over 4 ft in length. 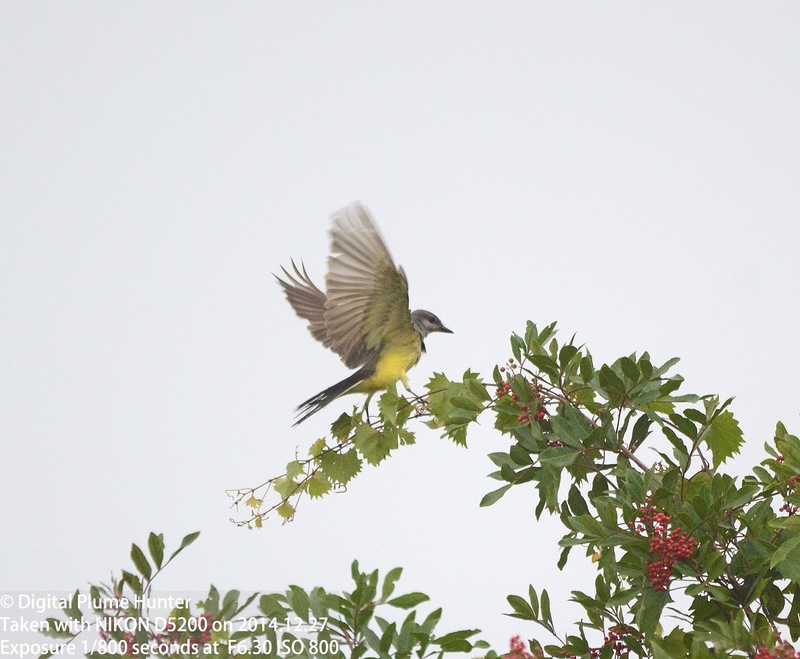 Thanks to an invite from master photographer and wildlife enthusiast, Bob Pelkey, this blogger arrived at a prime area for Crested Caracara, Western Kingbird and Scissor-tailed Flycatcher -- known in the local birding community as "Church Rd". This hotspot is located about a mile west of where Rt. 29 and Church Rd intersect in Hendry Co. 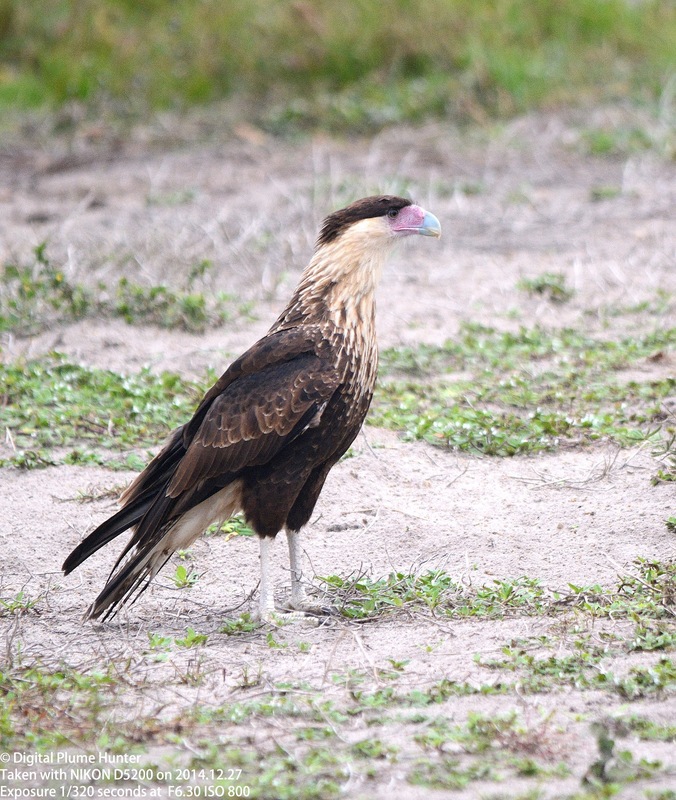 In Florida, it is estimated that there are about 500 breeding pairs of Crested Caracara and the species is listed as "Threatened". The Florida population is a distinct population segment (DPS) separated from their kin in Texas since the last glacial age. 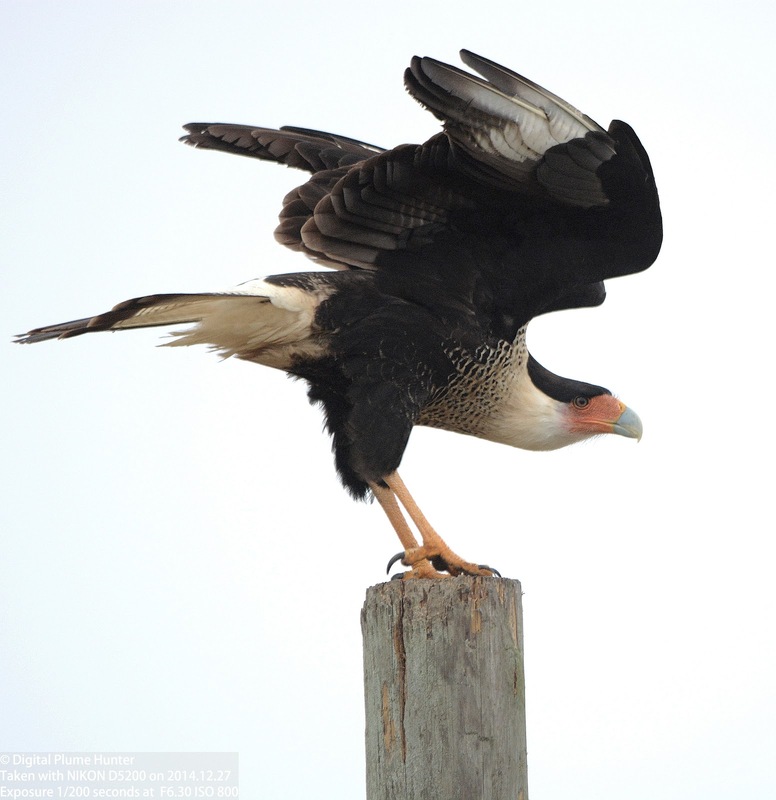 As the picture above shows, Caracaras are frequently found by the roadside where they benefit from easy access to roadkill. 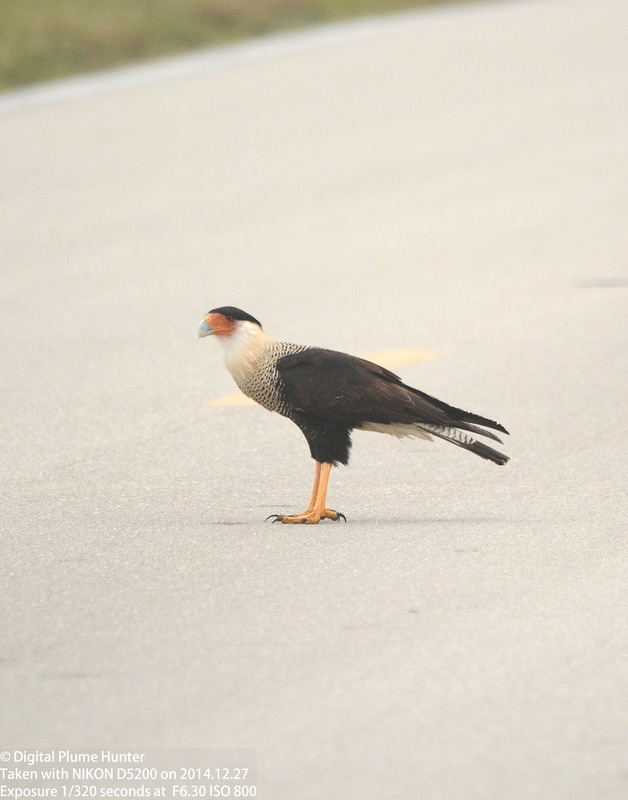 Unfortunately, this is a deadly blessing -- in one study, up to 55% of tagged Caracaras died from vehicle collisions (FWS Study). Threats to the US population aside, globally, the numbers of Northern Caracara are increasing and the species is listed as "Least Concern". 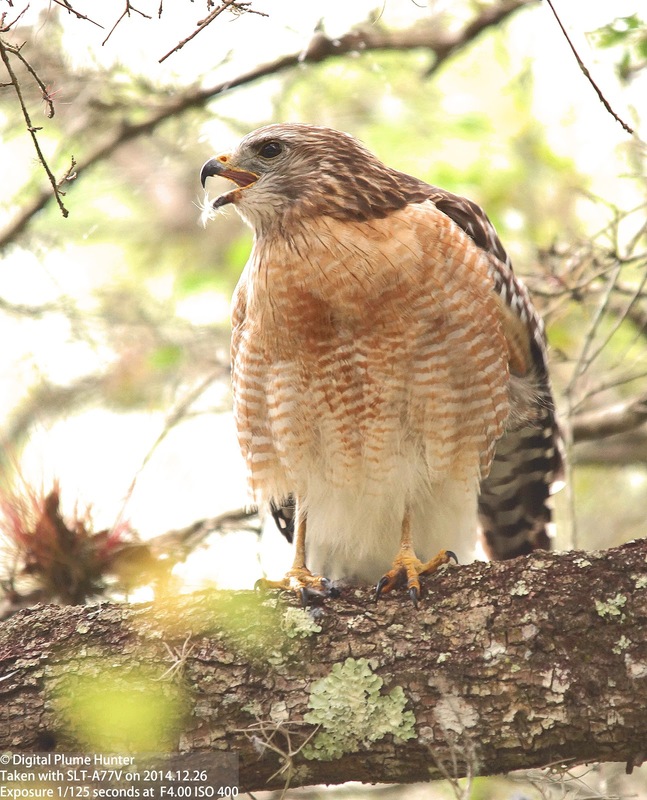 The Red-shouldered embodies all the characteristics we would expect from a Buteo hawk -- a compact, sturdy build, broad, rounded wings and a comparatively short tail. 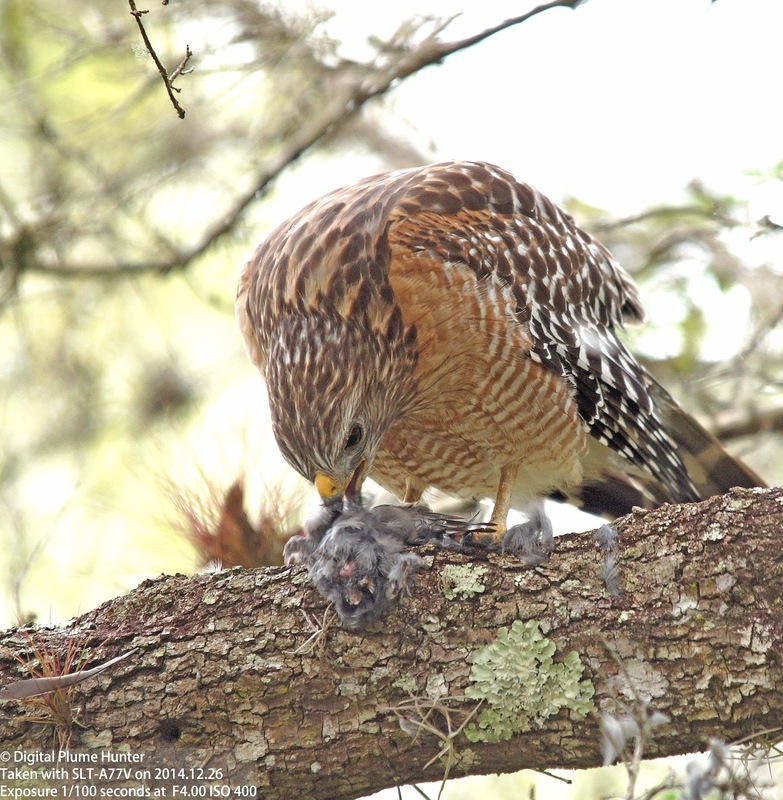 This particular hawk devoured a Grey Catbird with great gusto and efficiency in precisely 18 minutes and 50 seconds resulting in both horrified amazement and awe on part of the observer. This is a colorful hawk but most of us will not see this when the hawk is either soaring or perched standing still. 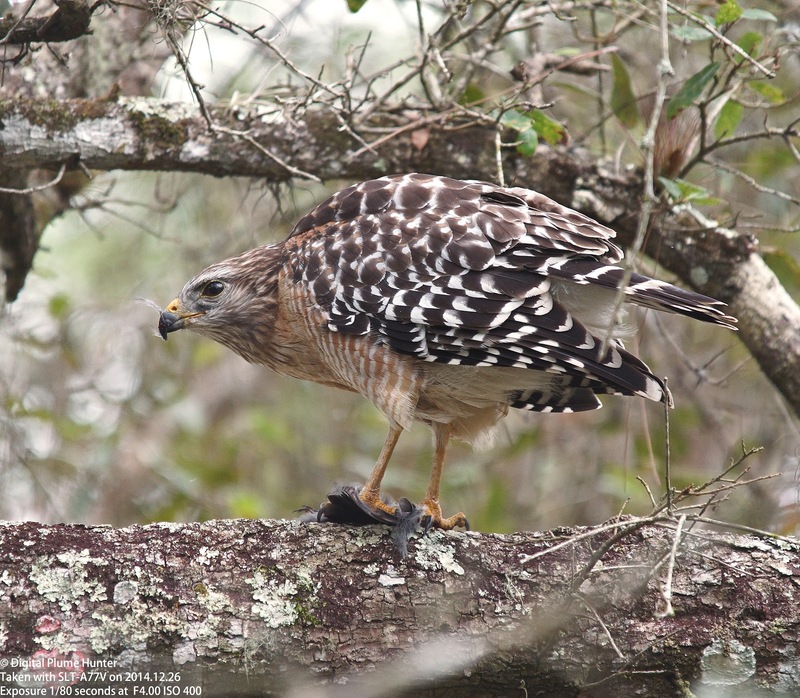 The full beauty of the Red-shouldered Hawk is more easily appreciated at close quarters when the strongly contrasting checkered tail and wings, finely barred front, rufous streaking on the face, head and breast, and scalloped back are more clearly visible. 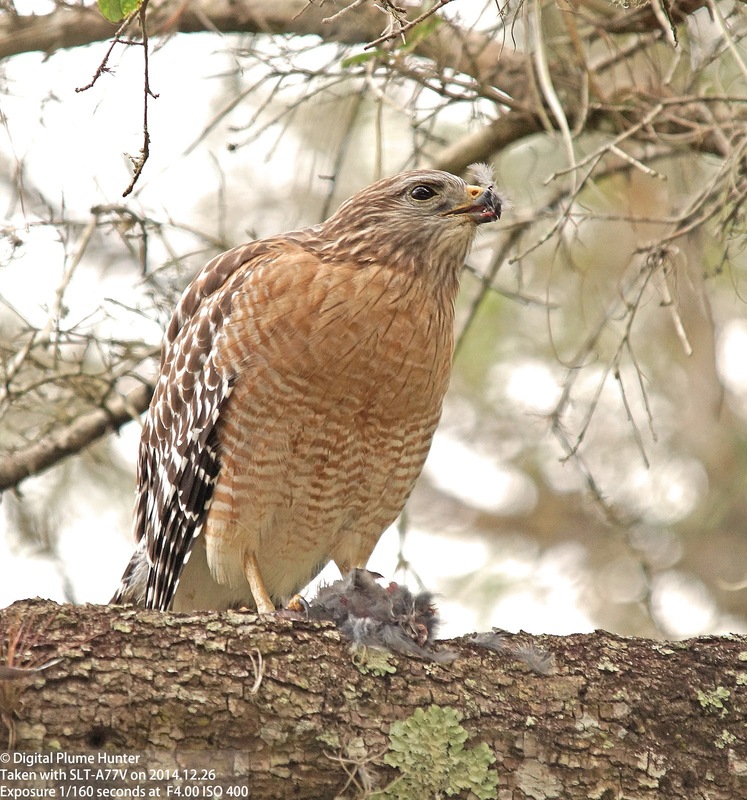 After completing its hearty meal of Grey Catbird, this Red-shouldered Hawk proceeded to call loudly -- this is courting season for the hawks and they are getting ready to nest. 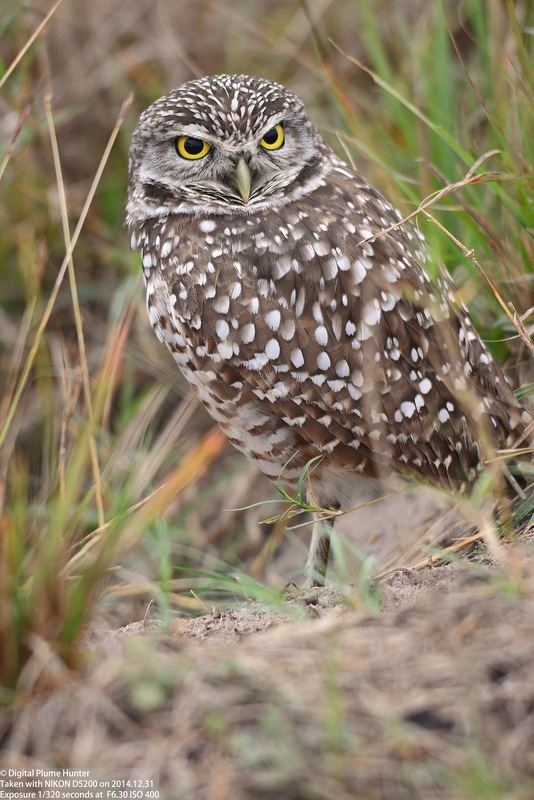 Another example of why Florida is unique in birding, the Burrowing Owl, like the Caracara, is found only in the Western US other than in the state of Florida. 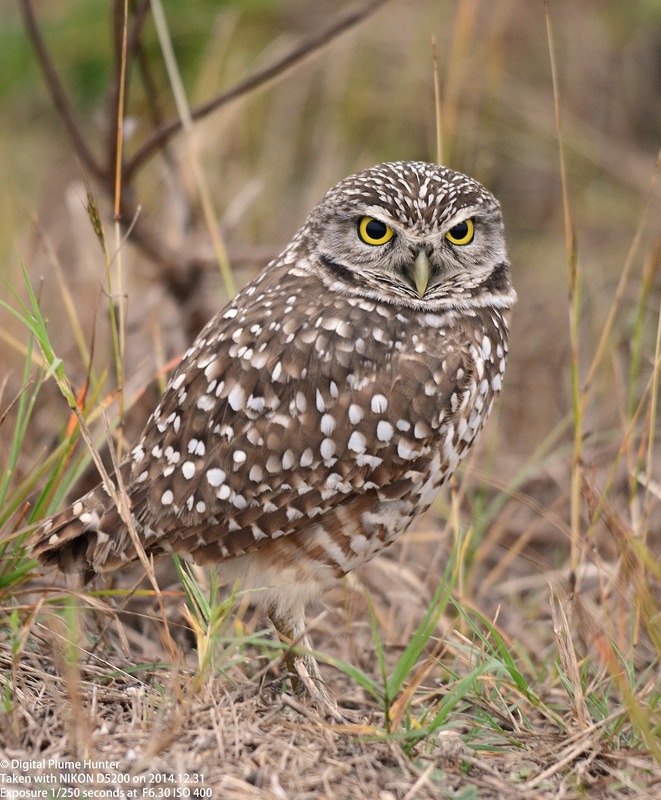 This uniquely terrestrial owl is hanging on in Florida in the face of rampant development. 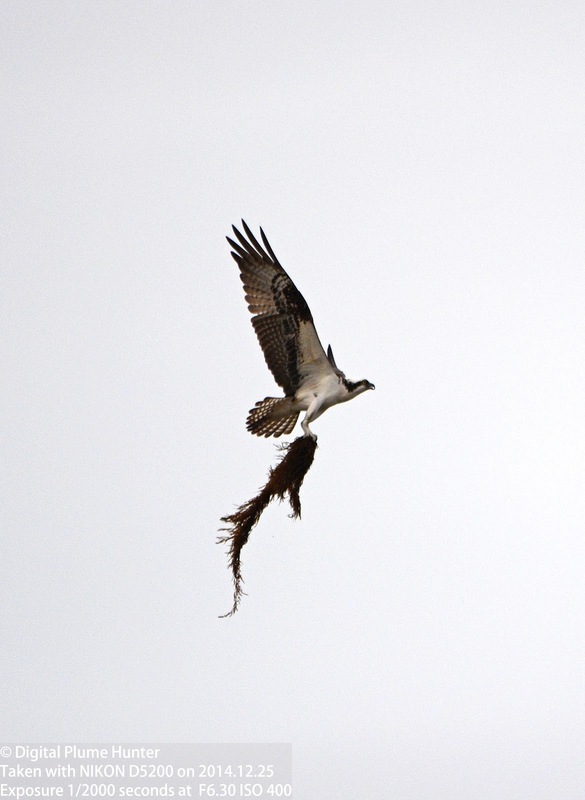 While the Osprey is commonly called a "Fish Hawk", it is not a hawk -- indeed, it is placed in its own Family. 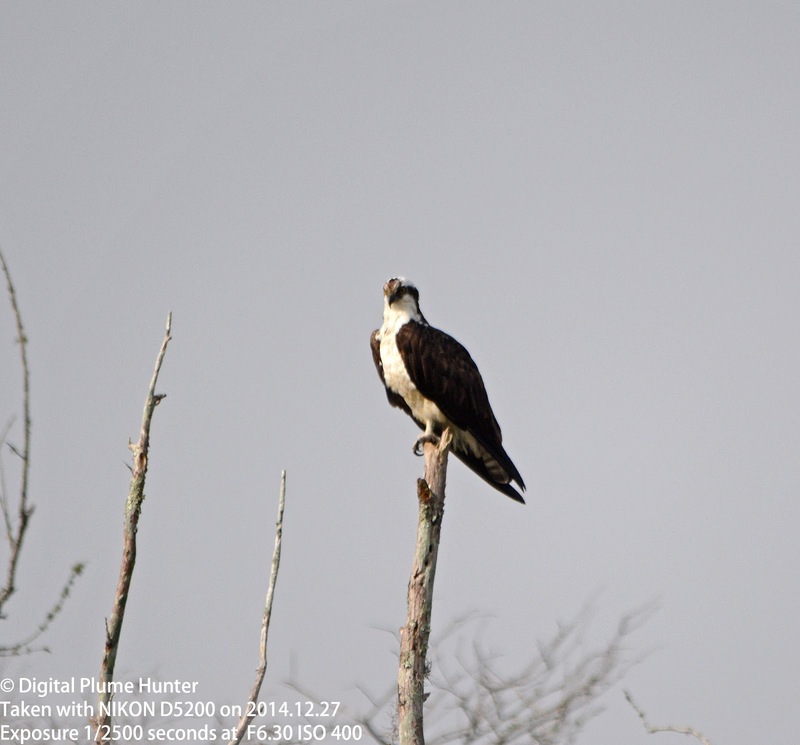 The Osprey, like the Peregrine Falcon, is a truly global raptor found widely in the Americas, Europe, Asia and Australia. 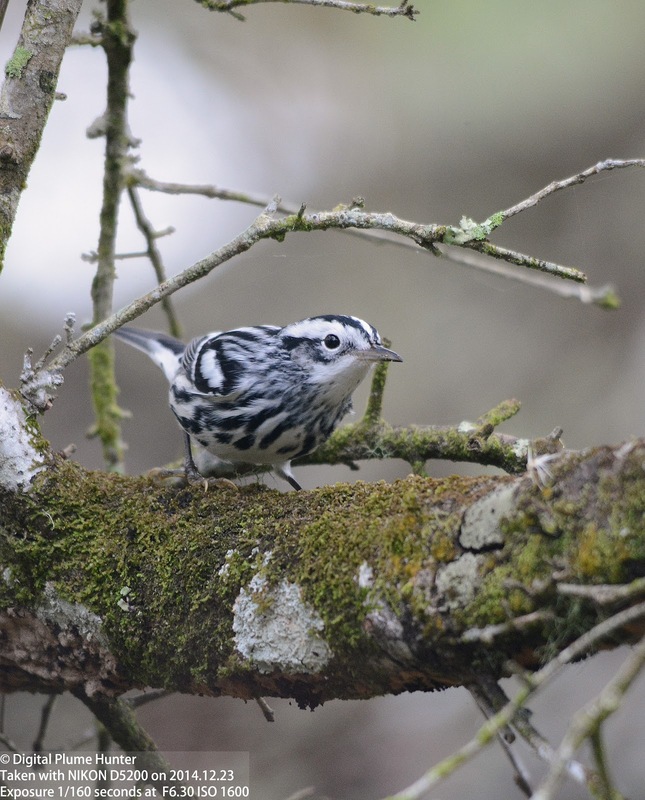 While a handful of subspecies are recognized, it is quite possible that they will be awarded full species status in the future given their isolation. Indeed, the Australian Osprey which is the smallest and most distinctive, is already recognized by some as a full species known as "Eastern Osprey". 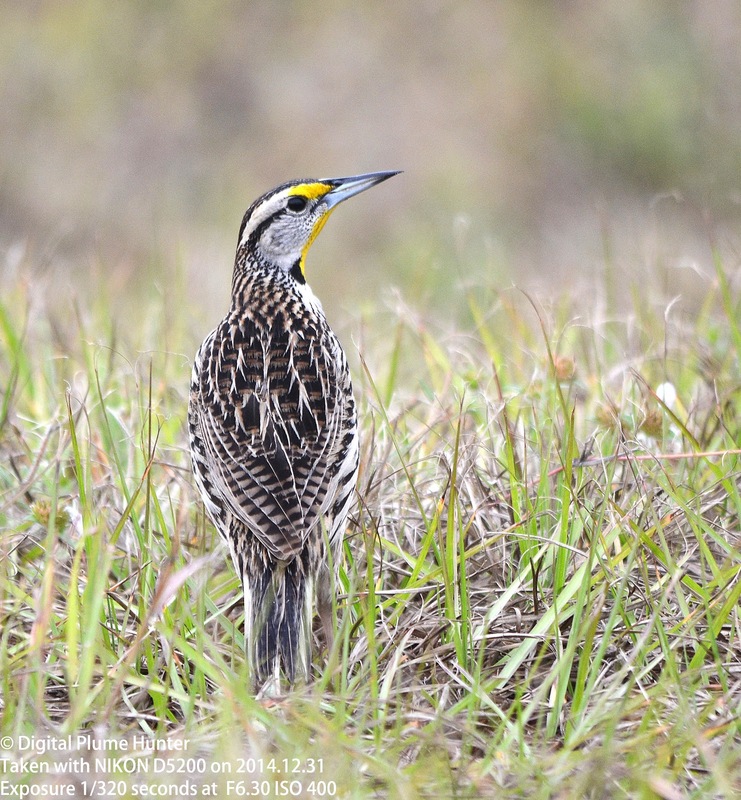 The perils confronted by the raptors are very real -- toxins, human persecution, and loss of habitat. 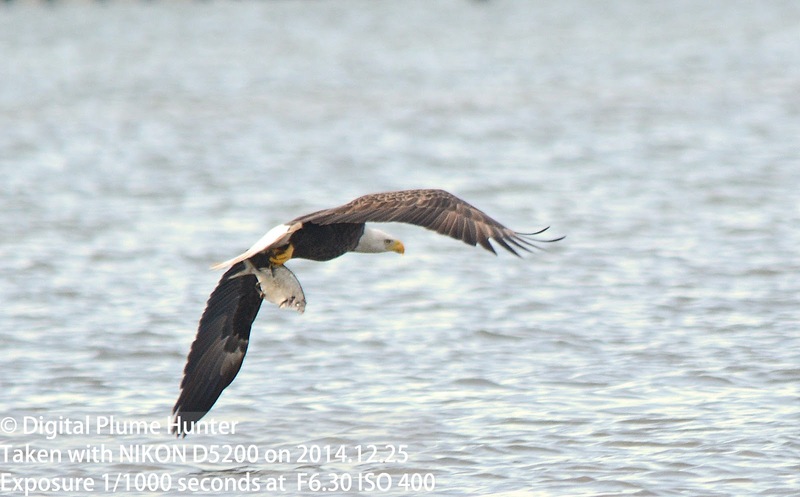 However, the comeback of the Bald Eagle from near extinction is a telling example of the success that conservation efforts can achieve.